You are here: Home / Resources / He Is So Worth It. We fall more and more in love with this boy every day. 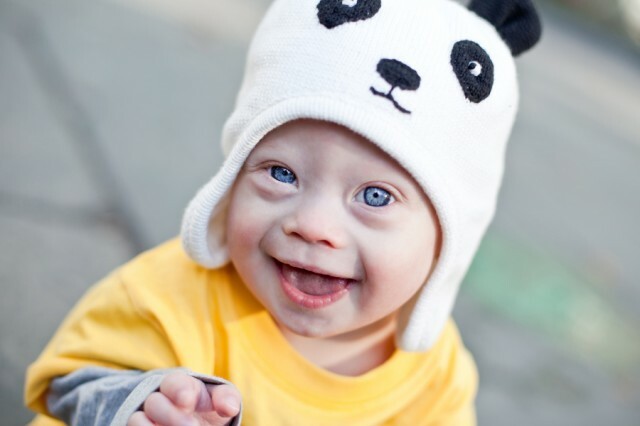 I wonder if anyone could look this little boy in the eyes and tell him that kids born with Down syndrome aren’t worth it? Noah, my precious 15 month old Kaylen, and every other child with Down Syndrome (actually ANY child!) are so worth it! Definitely blessings from God. My Kaylen is definitely a blessing and with her extra chromosome came extra giggles, extra smiles, extra kisses, and a whole lot of extra JOY! Love love love that blue-eyed boy! I belong to a wonderful parent group, Down Syndrome Network Oregon, http://www.dsnor.org, and we are all so in love with all of the kids, not just our own. Suzanne has a wonderful community of friends that she will be able to share her life with and who will always understand and accept her. As a mom, I really enjoye watching our kids grow up and become so extraordinary. There is nothing these kids can’t do! That is the point you are wonderfully making. If the 9 out 10 mothers prepared to abort would just look Noah in those big beautiful blue eyes they would change their minds. These scared parents are confronted by careless, uncaring or both doctors giving them incorrect outdated information. If they would take a few days to get an objective view they may change their minds. I am not going to sugar-coat it. My journey the past five years with my daughter hasn’t always been sunshine and rainbows. I see her struggle to do things that just come naturally to typically developing children. But ALL children have joys and challenges. The joys far outweight the woes. I read a book recently entitled “Making a Case for Life” by Stephanie Wincik. I would recommend it for all prospective parents. My daughter is here for a reason. With your message spreading like wildfire I pray that these heartbreaking statistics will change. The world needs our children. God has sent them to teach us all. If we keep throwing away his gifts I fear for the future of mankind. This little boy is absolutely precious! Those eyes are just breath taking! Thank you for sharing his life with us! I feel blessed to be able to watch such a fine little fellow grow! By the way, not sure if you say our picture the other day, but Noah got to hang out with Chris Burke the other day in NYC. It was awesome! I can’t wait to write about it. I did! I was so excited to see he’s gotten to meet Chris – He’s such a wonderful man! Can’t wait to read about your family’s Northeastern excursion and all the lovely people you’ve met! You’ve inspired me to get involved more with my community. I’ve learned it shouldn’t take having a child with Down syndrome to raise awareness. I noticed in my area, playgroups are still very very segregated – from color right down to financial status. I’m hoping to start a playgroup in my general area where children from all walks of life can get together and play without judgement. Rick, I usually think Noah looks like you in his pictures but I can totally see your wife in him in this one! He is a precious blessing! God Bless. Thanks. We agree…he is precious indeed. Thanks so much, how far along are you? Please keep us posted about your baby…and thanks for all the kind words about our family and our site. You rock! We enjoy sharing his journey with everyone. Well I’m 4 and 1/2 months along and can’t wait to have a little cousin for my nephew. My nephew is 4 and he is walking and talking and like I said before, a JOY in my life. I see the JOY in little Noah too and I think that’s why he’s connecting all these people!!! Noah is a gorgeous child. I love, love , love his blue eyes. I really see the resemblance between he and his mom in this picture, his smile. Noah is absolutley beautiful and his is absolutley a life worth living. God bless him always. I just couldn’t have or keep a child with DS. I know one child with it and I really feel for his family.